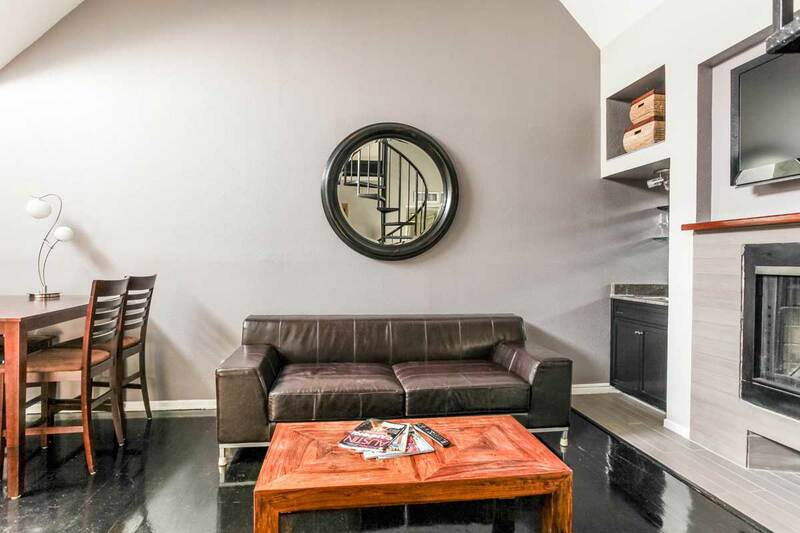 The Director’s Loft provides fantastic accommodations for groups and business travelers in downtown Austin. The space is complete with 4 bedrooms, 2 bathrooms, an amazing kitchen, a small balcony, wood burning fireplace, a large flat screen television in the living area, and much more. This is the perfect space for those attending events at the Austin Convention Center, or who desire central locations with excellent walkability. 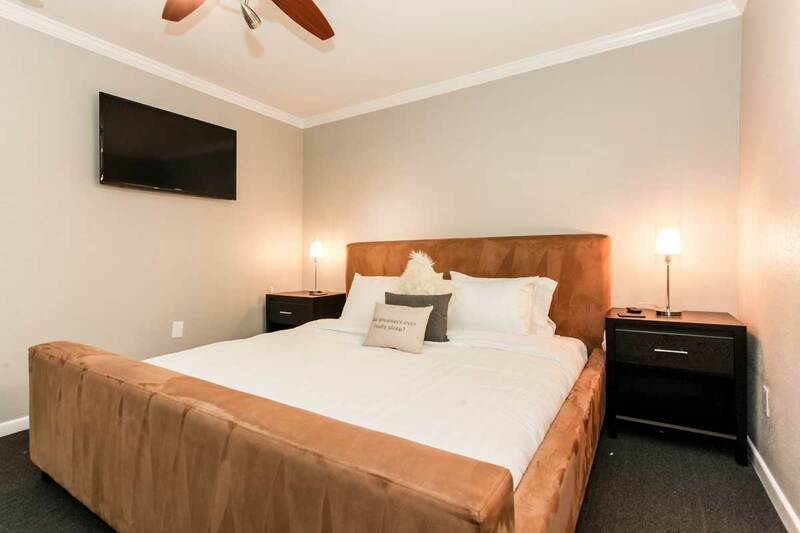 Conveniently located between San Jacinto and Trinity on 4th Street, this condo is fully furnished with everything you need for an incredible stay in the music capital of the world. Situated just across the street from the Austin Convention Center, two blocks from the world famous 6th Street, Congress, and the Warehouse District, and a handful of blocks from every other downtown attraction including hundreds of restaurants, movie theaters, bars, nightclubs, lounges, and live music venues, the location cannot be beat. The town lake walking/jogging trail is just a few blocks away, there is a yoga studio just across the street, Starbucks is 200 feet from the front door, and arrangements can be made for a temporary gym membership two blocks away during your visit, if desired. 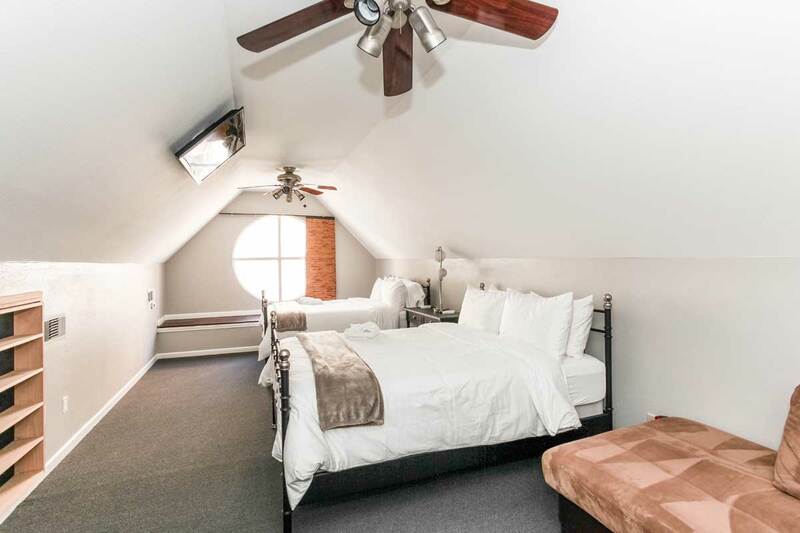 This 1,500 square foot unit features accommodations for up to 12 guests (one king bed, three queen beds, 2 twin beds, and additional sofas/air mattresses, central air and heat, a full sized stackable washer and dryer, free cable television, free wireless internet access, wood burning fireplace, and plush furnishings. 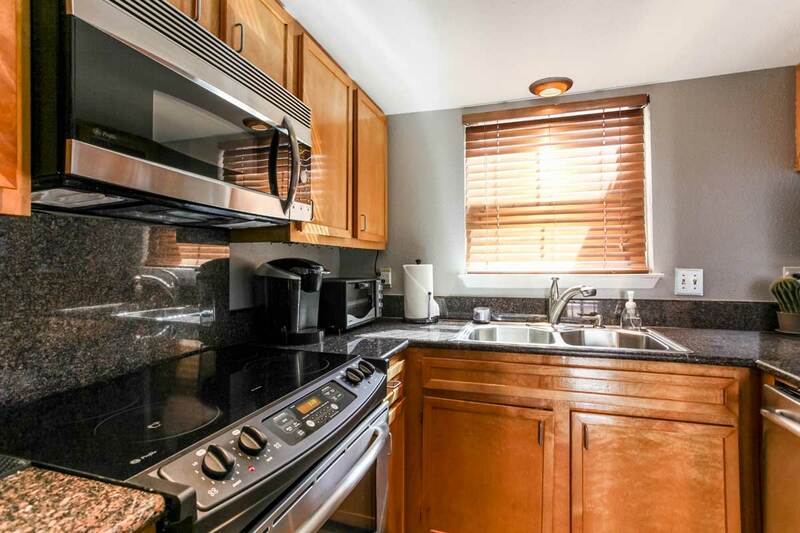 With granite counter tops and stainless steel appliances, the kitchen comes fully stocked with all of the utensils needed to prepare your favorite meal. There are flat screen televisions in all four bedrooms mounted on the walls, and of course, a large flat screen television in the living room. You will receive access to free private gated parking area with space for one car (plus a motorcycle or scooter), if you need it. Since you can walk to everything, you might consider taking the Capitol Metro bus from Austin Bergstrom International for $1.75 per person. It picks up and drops off in front of the building every 30 minutes, and will save you the hassle and expense of a rental car or taxi. The taxi rate from the airport is about $30. We now also have Uber in Austin, so be sure to download their app if you are not yet familiar with their service. There is an outdoor pool area just across the street, in the neighboring building that is part of our overall complex. You can use the same gate code to enter the pool building. Ryan was an amazing host! From start to finish he was incredibly welcoming and informative with the listing and its surrounding attractions. The place itself was fantastic, perfectly located in Austin near everything you want to be near as a visitor. Would definitely come back to visit Austin again. Would most definitely book a reservation with Ryan again. Thank you, Ryan! This was an awesome rental in a prime location. Everything (restaurants, bars, shops, etc.) is walking distance from the condo. We loved using a passcode for entrance rather than a key because this allowed for group flexibility. We (group of 10, all young 20’s) stayed for 2 nights. We received the apartment in great condition (clean, well-stocked with supplies). I think had our stay been longer the space would have gotten too tight, but it worked well for what we wanted (price, location, amenities). The master bathroom was smaller than anticipated, but the description posted is fairly accurate. The loft space is a hidden gem! We never figured out how to work the TVs, but we honestly didn’t try that hard. We were too busy having fun in Austin! Be aware that there is only 1 parking spot in the complex garage. Street parking wasn’t too bad though. I would definitely stay here again in the future. Thanks Ryan! it is a great location and was clean and well furnished. We added a cork screw to the kitchen equipment and had a lovely time. Only issue was one morning the parking spot was taken by another person but I think they had just parked in the wrong spot. Thanks to Ryan and his team, my friends and I (12 in total) had a great time in this centrally-located apartment in Austin. The whole experience from the use of a keypad so we didn’t have to think about keys to the ample towels/linens allowed us to enjoy our stay in the comfort of a home without losing the luxury of a hotel. Ryan and his team are professional, friendly, and very quick to pick up the phone to answer questions. Thomas, in particular, has lived in Austin for a long time, so he could answer logistical questions about parking and also make recommendations for food and drink. We’ll certainly be in Austin again soon and will make sure to book this place again. Great place in the middle of Austin. All the best neighborhoods are in close walking distance, and the condo is more than big enough for a very large group. Logistics are simple with the hosts, and everything was very smooth for us. Would stay again in a heartbeat. The Director’s Suite was absolutely perfect for the large bachelor party group we had. The style and decor are perfect for a bro weekend. The beds are super comfy and there are plenty, plus two plush sofas upstairs that could easily be slept on. Everything was stocked including shampoo, conditioner and soap. The location is great and you can walk anywhere downtown. Ryan was a great host. We had trouble getting in the door when we arrived, he had provided his cell number so I gave him a call and he unlocked the door from his phone for us (how cool is that?!). Then he recent the info email that had gone missing and periodically checked in on us via text. We loved everything about staying at the Director’s Suite. Ryan and his team were very communicative, attentive and helpful. The condo was great for our group, very clean and in an unbeatable location. We were able to park our surplus vehicles at the hotel across the street for free and most folks were able to sleep (if we didn’t stay up half the night anyways!). We only had one minor issue with the condo during our stay and Ryan’s team responded very quickly. Thank you and I would definitely stay here again with a group in Austin! Very convenient experience. The keyless entry makes checking in and checking out a breeze. Great location, walkable in just a few mins to everything downtown. Plenty of sheets, towels, toiletries for a full house. An overall great experience. The experience that we received from Ryan and his team was exceptional. Every issue that we faced was dealt with quickly and to our satisfaction. I would highly recommend this unit for anyone looking for a nice, convenient place to stay in Austin. It is in the perfect location — walking distance to everything. I would definitely look into staying at this or another of Ryan’s properties on my next visit to Austin. Host was great, listing was as advertised and we were welcomed at the time indicated without any issues. Ryan and his team were extremely welcoming and made the whole process very easy from booking to check-in to check-out. All the info we could have possibly needed was written out, but they were always available by phone, too. We were 10 guys for a bachelor party. The location was perfect! A short walk to both 6th St. and Rainey St. The condo was in great shape. I would highly recommend it for groups our size. Only thing to keep in mind for big groups is there are only 2 bathrooms, but it wasn’t an issue for us. They let us check in a few hours early at the last minute since one of the guys in our group was there early. I’m sure that’s not always possible, but they adjusted on the fly. Highly recommend! Excellent rental. The condo was as described, was in great condition, and had all of the amenities that one would hope for. Towels, shampoo, trash bags etc were all there for us. 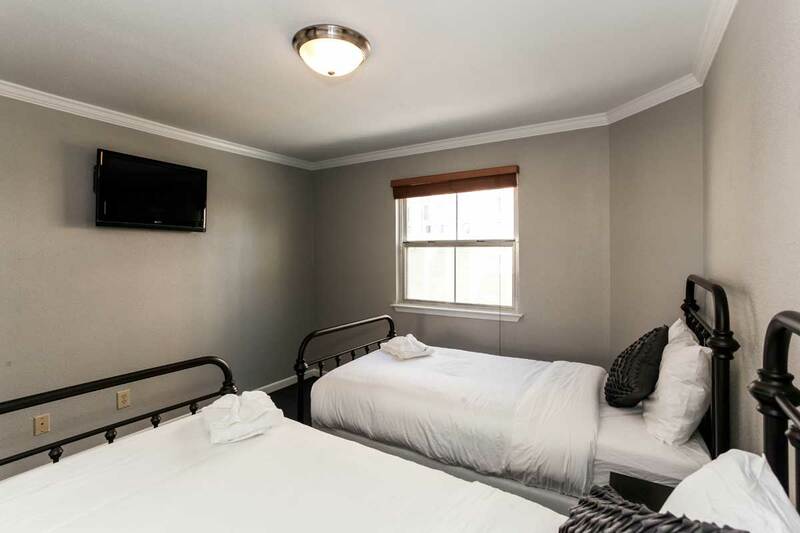 Coded entries make the complex and unit easily accessible for a group, AC and comfortable beds made our stay very pleasant. 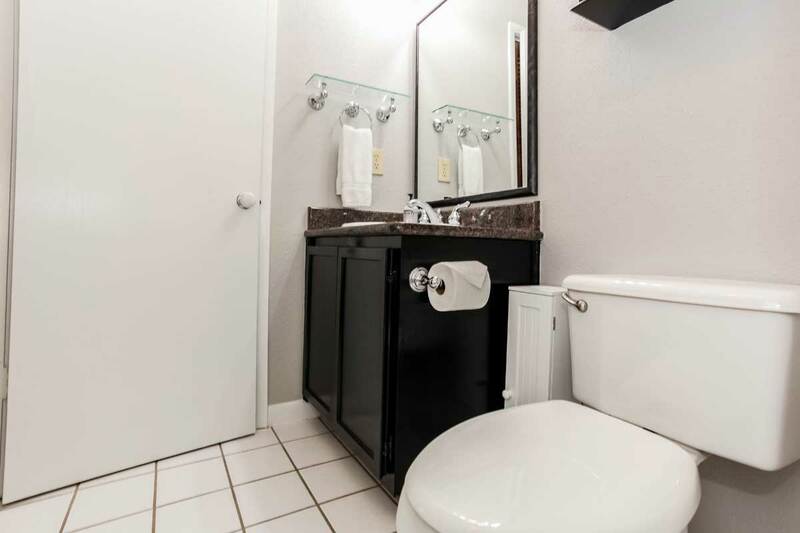 This condo is in a prime location if you want to experience downtown Austin. Everything is within walking distance, and transportation to the airport couldn’t be more convenient. This is an extremely convenient location, close to the convention center and downtown. Lots to do in the area. Ryan and his team did an excellent job with communication and requests. The Keurig with coffee available was a very nice touch. Awesome location, great property, and fast support. Everything went great! My company and I stayed here for NI Week and Austin and loved it! Location was awesome, and the house worked out great for our group. Ryan was very responsive to any requests. I would stay here again. Great service! I was in Austin on business with 4 colleagues and this was a perfect place. Ryan was a great host! This condo fit all of our needs perfectly. The location is amazing, the unit is perfectly finished and great for a larger group. Ryan was flexible with our check in and check out times and provided a great summary of cool things to do while in Austin. I would highly recommend this place to others looking to visit Austin! My experience with the Director’s Suite and with Ryan Windsor were both phenomenal. Ryan was very accessible and flexible and – with one comprehensive email – provided me with all the information I needed to get set up in the unit. He also included local information in the event I wasn’t familiar with the area. The unit itself is beautiful and had everything my 8 person group needed for our stay. The appliances were top notch, there was plenty of very nice silverware/plates/cookware for our use, having the use of a name-brand washer and dryer was a great bonus and all the cleaning products/soap/shampoo/conditioner, etc were also provided in the unit. The beds were extremely comfortable, the bathrooms (and the entire unit itself) were impeccable and the temperature controls were excellent, which kept us extremely comfortable both day and night (it was over 100 one of the days we were there – the air conditioning kept the unit at our preferred temp of 68 without a single issue). The location is perfect!! We were able to enjoy three days in Austin without once thinking we needed a car – look for yourself on google and yelp – there is enough around this location to fill a month’s worth of activities. The inclusion of a gated and reserved parking spot was perfect for my rental car and I was able to shuttle all of my friends back and forth to the airport knowing that – despite the traffic of downtown Austin – I would have a guaranteed spot back at the unit. In short, if you have a large group and are planning to visit Austin, definitely consider this unit! We paid less than what it would have cost us for a hotel and we got FAR more than we would have if we had all rented individual rooms. Plus, we had the benefit of being able to stay together and enjoy each other’s company during the down times, which you just can’t get at a hotel with individual rooms. Highly recommended!!!! I stayed here for Keller Williams Mega Camp with a group of people and we rented both this unit and the Silver Screen condo directly next door. It was perfect for our group! Very walkable to everywhere downtown where we needed to be. The unit was clean, spacious, and the keyless entry was perfect so we didn’t have to worry about everyone having and keeping track of keys. Ryan was easy to communicate with and very friendly the entire process. I would definitely recommend! Great for groups! We came with a group of 8 for a bachelor party and had a bed or couch for everyone. 2 Bathrooms was a bit tough to manage but we knew that going in. Management is professional & responsive to any issues. The listing and description is accurate. You can’t get any better with the location as it is only 3 blocks from the famous 6th Street! The host was easy to communicate with and quick with his responses. Seems like a nice guy too. The amenities is the biggest concern. The wifi connection was terrible. Only one of the cable TV remotes worked and there were a total of 5 TVs. It was very frustrating for each person to find the one working remote to change a channel in his/her room. The upstairs TV didn’t even work. The master bedroom shower curtain was too short for the shower. Each time someone showered, there would be a significant puddle there. We had to throw 2-3 towels on the ground to soak it up. Good thing he provided an ample amount of towels. We stayed here during New Year’s weekend, so we payed about $600/night. Premium pricing for subpar amenities. These are all fixable issues, and I’m sure he will fix it after this review. Can’t beat the location though…. Was an awesome location, could walk right over to 6th street in no time. The apartment had plenty of beds for 8-10 ppl to sleep comfortably. Lots of towels and shampoo were provided in each bathroom which was a pleasant suprise. The living space was a little tight but with the whole city at your doorstep, we didn’t stay inside much. Ryan was super helpful and overall it was a great place. 3rd floor is great and balcony with views is awesome. 3rd floor also reduces the street noise on weekends. Very accommodating hosts and unit was clean and as described. Central to everything and big bonus to be able to walk/run to riverwalk. We rented a car which was not necessary as everything is in walking distance. Also, plus that airport shuttle drops off across the street at the convention center with fare of $1.75. Great stay. Would definitely stay here again. This condo is perfectly located for anyone attending an event at the convention center. 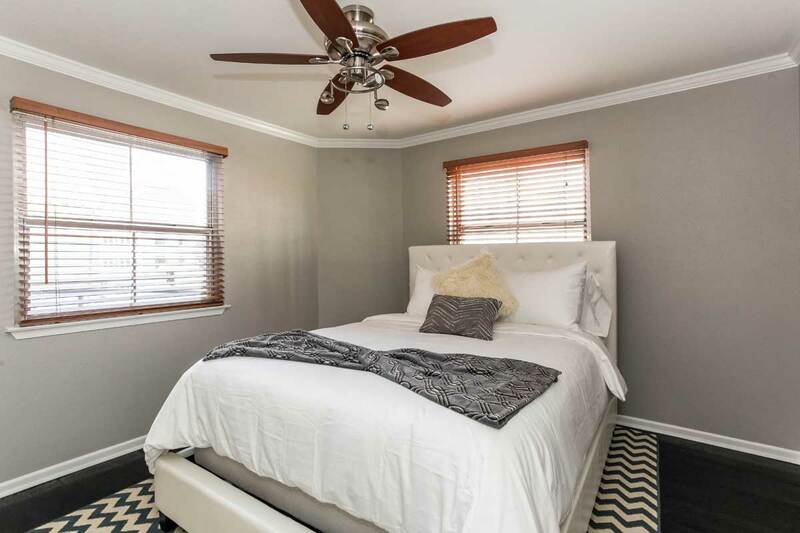 It is as advertised and the location is convenient to downtown and Rainey street. Awesome location, great apartment. Thanks! Quick responses to questions, clear instructions on getting into the place, clean and comfortable condo. I’d stay here again. Great place, location and host. Would stay again! Ryan is a good communicator, and eager to help. This is run like a hotel, so you aren’t getting the personal connection you may with another Airbnb listing. I left my travel kit in the bathroom and it disappeared with the cleaning crew. Multiple attempts to call and email Ryan resulted in no return of my property. This isn’t something that would happen with a 1:1 home listing that I’ve grown to love about Airbnb. If you need central access to downtown Austin, this place hits the mark. This was my first ABB experience, I have to say it will not be my last. Our host Ryan could have not been more helpful with my first stay. The condo was great and was all that we expected. Thank you guys! Second time staying at this location. Such a great location and so well maintained. Looking forward to coming again soon. The location was immaculate and they were very attentive. The condo had more than enough supplies for the four of us. (Towels, bathroom and laundry supplies, coffee pods, etc). The beds were extremely comfortable and they had extra blankets and pillows. It was great having the dishwasher, clothes washer and dryer available. It was close to the heart of everything – a few blocks to Rainey St and 6th street. The convention center was around the corner and public transportation was readily available. Great restaurants were nearby and we had a choice of many that were only a block away. (Piranha Killer Sushi!) The complex was quiet and we felt safe walking the neighborhood even late at night. I would highly recommend this location to anyone! The loft was huge and isolated from the other bedrooms, so if I was traveling with my kids there would be ample separation. My VP’s loved everything about this place and thought everything was perfect. They loved Austin and will defiantly book again. Awesome place in the heart of downtown. Right next to hotels so there’s always plenty of cabs (now that Uber and Lyft are gone). Place is clean, good amount of space, and has a great pool close. Would definitely come back! Dealing with Ryan was a huge pleasure. He responded to everything we had thrown his way from the tiny things to the questions that I didn’t even expect an answer for and he came through. The place is great and the location is perfect. It was a great experience and Austin was beautiful, can’t wait to be back. Easy to find the place and checked in with no problems. I had no issues during my stay and so I never actually met with the host. Every bed had towels laid out already and plenty of dishes and utensils for guests. One of the easiest AirBnBs that I’ve stayed at and had no issues with the apartment. Would come again! The condo is great! Right across the street from the Convention Center. On the 3rd floor (no elevator) but an easy climb. Comfortable beds. No dressers for clothing storage but closets. Nice kitchen. I was given a ton of info for the area. We had never visited Austin so we used a lot of what Ryan suggested. 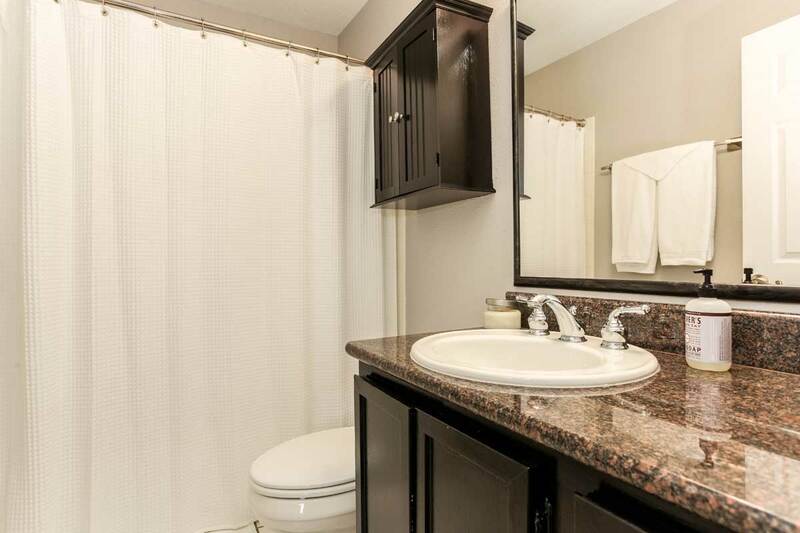 The location of this condo could have not been better. We walked everywhere. The place was very clean and well kept. It felt upscale and that’s exactly what we were looking for. We’d love to go back! To begin, the place was amazing. We stayed for a conference in the convention center which is literally across the street. Six of us stayed incredibly comfortably and we even had a fellow conference attendee crash on one of the many couches one of the nights. The kitchen was perfect for our purposes and was well stocked with spices. Additionally, the host was kind enough to provide us with early check-in which made for ideal timing. If I am in Austin again, I will definitely try to stay in one of Ryan’s properties again. The location was unbeatable with easy walks to both sixth and Rainey streets even in the summer heat. The condo was clean and everything worked great. The coffee machine/pods were greatly appreciated. Ryan was very responsive, even with reservation change requests. The Director’s Suite was a perfect location for our group bachelorette party. Plenty of comfortable beds and it was very nice having 2 full bathrooms. Checking in was very easy and Ryan was very accommodating when we needed a later check out at the last minute. Walking distance from great restaurants, bars, and Rainey Street. I had a great experience staying at this residence and working with Ryan. As a group of professionals in our 30’s, the apartment met all our needs. 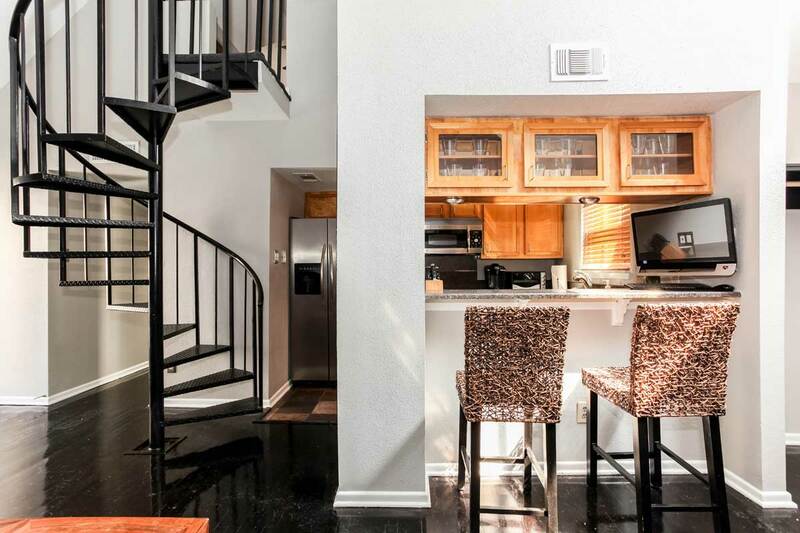 The location is perfect and a short walk to all the hot spots in Austin. If you have a party of under 12 people, this location should fit your needs for any visit to the Austin area. Our host was great, though for whatever reason, we didn’t get the confirmation email with the entry code when we arrived so we were in the humid weather for a little bit. Upon entry, everything was great. The photos are accurate, the place was very clean and the best part was that it was a block away from the conference we needed to attend. Location overall was great, walking distance to everything since Ubers/Lyfts are no longer available in Austin. The AC was working well at all times. It was overall a very positive experience. Ryan and team were very welcoming. I used the welcome email they sent when we booked to help plan the trip, and leaned on the team for help with logistics (like getting a charter to pick us up at the airport). Would highly recommend Ryan! The apartment was clean and tidy. Even though I showed up early, the host was kind enough to let us do an early check in. Had a wonderful time in Austin! The host went above and beyond to make sure we had a great experience! Even let us have late checkout which was great. Great place and very responsive. The Director’s Suite was great! Ryan was very helpful, and the condo itself is gorgeous. It was spotless, and the beds were particularly comfortable. The layout of the condo is very conducive to entertaining, which was great as we were there as a bachelorette party. The building itself is clean and very conveniently located to bars and restaurants. I highly recommend it! Very attentive host, and awesome condo! We were in town for a couple of days performing at SXSW and things couldn’t have been smoother. We were given codes for entry so we didn’t have to worry about holding on to keys, the pad was stocked with everything that we needed, including enough champagne flutes for our post-performance toast. Definitely would stay here again! Great Host! Great Place! Great Time! Have to say best bnb I been to so far. Will try to stay there everytine I’m in Austin. Host was great! Location and home was cozy and spectacular! This is a great spot to stay in Austin! We were there for SXSW and we were walking distance to everything we needed. The apartment is very nice and modern. We had 6 people and it fit us all perfectly. It was clean and comfortable. Great restaurants and coffee shops in walking distance. Communication with Ryan and Thomas was great and they were always quick to respond and very accommodating. Check in was easy. I highly recommend this place! Ryan and The Director’s Suite exceeded our expectations. The apartment is in a great location, is well kept, and has all the kitchen and bedding essentials you’ll need for a stay in Austin. In addition, everything about it is as described online. Most impressive was Ryan’s outstanding customer service throughout our stay, responding immediately to calls and texts and checking in to make sure things were going well. Highly recommended! Ryan’s place was great! A really fancy apartment that easily slept 5 of us. Beds were comfy, had all the amenities we needed (car parking space was super useful) The best feature for us was its proximity to 6th street. We felt right in the heart of the city and only a few blocks to walk to get to the fun. The flipside of this is that it was noisy until quite late. This was on a Saturday though, i don’t know what other evenings or other Saturdays would be like. I’d certainly stay here again. The host was super responsive and helpful. Great place in the heart of everything Austin. within minutes you can be on 6th St, or Rainey St all within a short walk. Nice Condo with plenty of room for 6 guys. Ryan was a great host. We had some wifi issues and Ryan worked very diligently and resolved them during our stay. Thomas and Ryan were great hosts. Extremely responsive and very knowledgable of the area. We all at a great time due to their recommendations. Ryan and Thomas were very gracious hosts. They were responsive and helped a bunch when I accidentally left a burner on while we left for a quick lunch. I appreciated their consideration and quick thinking. Highly recommended. Perfect location for downtown business travelers. Great place-great location! When we booked, Ryan sent us a very descriptive welcome email with all necessary information for how to get into the complex and the apartment, as well as recommendations for places to go. Ryan was also able to work with us for an early check in. Overall great time in Austin! Great location, house was very well maintained. We thoroughly enjoyed our stay. HIGHLY recommend this listing and would gladly stay again. We thoroughly enjoyed our weekend in Austin…great location and great accommodations! There was so much to do and see that we didn’t have time to fit it all in. Can’t wait to try Airbnb again soon! Great, centrally located apartment. Ryan was very responsive and accommodating! 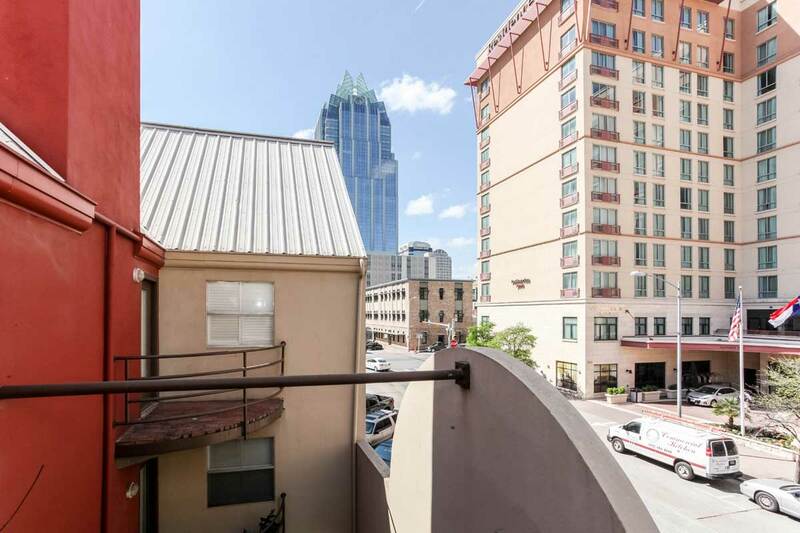 Spacious loft in the heart of downtown Austin! It was ideal for our group of 10 in town to celebrate a friend’s bachelorette party. We were able to walk to Rainey and 6th Streets, and there are a lot of cute coffee shops, cafes, and restaurants in the neighborhood. Ryan and his team were gracious hosts! They accommodated our check-in/check-out requests and were easily reachable for any questions that popped up during the weekend. Great location and unit. Perfect for groups and was very clean. The house was solid. Only 2 bathrooms for a whole lot of beds, but clean and as described. Location is unbeatable and very central, so no car needed. Keyless access, so check in and check out are super easy. Hosts were very accommodating and gave us extra late check-out. I would highly recommend this property and these property managers.